If there ever was a Caribbean collaboration of culture, zouk-love music, otherwise known as simply zouk or (incorrectly) zouk béton, is it. The genre is a festive mix between the Dominican cadence-lypso and bélé, French Martinican beguine, gwo ka from Guadeloupe, and traditional cadence rampa (kadans ranpa is Creole) from Haiti. Cadence-lypso provides much of the rhythmic and song structure to the music; bélé, beguine, and gwo ka inspired much of the instrumentation (particularly that of 21st century MIDI instruments and loops); and cadence rampa gives the music the Haitian connection and flair. Many people mistake the entire popular genre as being a truncated version of the sub-Caribbean zouk béton. This incorrectly-labeled music type was a brief spout of music created by French Antilles musicians, many of whom were versed in multi-cultural musical styles – a derivate. The structure was quick and heavily laden with MIDI instruments and sampling. Because it was a new and experimental sound, it became rapidly popular before abruptly fizzling out. Sometimes, traditional Haitian compas music (otherwise called konpa) is also mistaken; though the genre has its roots in compas music, this is also an inaccurate appropriation. Compas music began to gain traction in Haiti around 1957 with the popular Nemours Jean Baptiste, considered the granddaddy of the musical style. 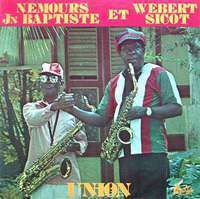 Baptiste performed with fellow Haitian saxophonist Webert Sicot, and together they formed the inspirational group Conjunto International. The band toured the Caribbean, spreading their take on the Haitian merengue, and gained a considerable following. There was dissonance in the leadership of the pair, though – after a while of tension, the duo eventually split apart and formed separate bands. When touring in Antilles, local musicians, keen to the different style of playing, wanted to emulate the new songs that Conjunto International were sharing. Once Antillean successes began sprouting up after Conjunto International’s visit, they renamed the style “zouk.” This name stuck, and eventually made its way back to Haiti. In the 1970s, Antillean and Dominican musicians became internationally known for their musical prowess. Despite its convoluted origins, the genre remains a popular and enticing musical staple in Caribbean and Haitian music. In addition to the old Conjunto International, one should also check out Kassav’, an influential young French band that performs many different kinds of fusion in Creole communities worldwide. They have contributed greatly in defining Haitian, Antilles, and other Caribbean musical styles globally.